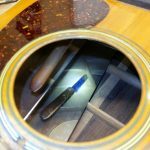 Mountain Song Guitars is excited to announce our expanded guitar repair services! We recently built a new shop and outfitted it with all the latest luthier equipment. 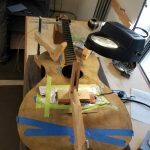 The luthiers in our guitar repair shop are passionate about providing the absolute best in stringed instrument repair and restoration. We are honored to have extensive experience working on some of the most valuable instruments in the country. 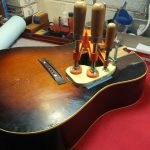 If you have a vintage instrument, one-of-a-kind heirloom, or high-end custom guitar, rest assured it will be in experienced, meticulous hands. Are you in the western North Carolina area? 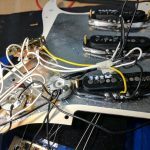 We’d love to be your local guitar shop! We provide highly custom, professional repairs for all levels. We are conveniently located just outside of Asheville, NC in Candler. 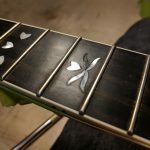 If you have a guitar that needs some extra special attention, send us a message briefly describing either the work you need to be done or the problems you’re experiencing. We will usually respond within 24 hours with available appointment times.